I'm entering this piece into the "Better Late Than Never" ebsq show, as I plum forgot to enter it into the "ORANGE" show back in October. 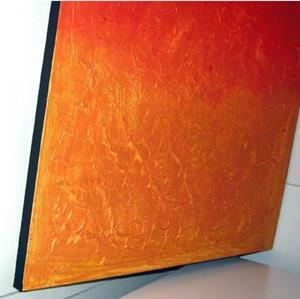 This large piece is extremely textured and the warm colors are blended into each other. 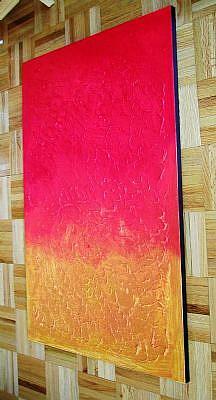 If you are a "touchy-feely" tactile person like myself, you'll LOVE the phenomenal texture in this piece! :) I tried to show all of the texture in the pics here, but I'm not sure the camera can fully capture the textural effects. 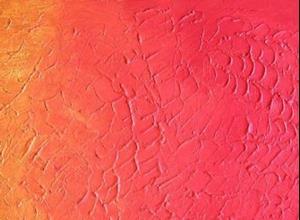 The overall predominant color is orange, but there is also red at the top. 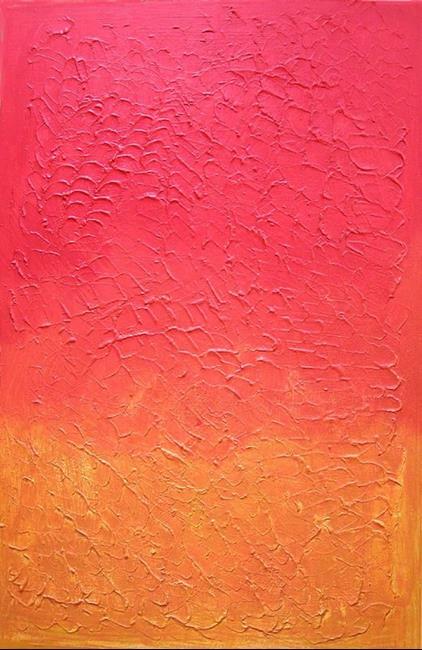 The very bottom is kind of a yellow ochre / orangey color, and the very top is red, and in the middle they are blended into each other. This gives the effect of a warm and cozy glowing fire in a fireplace. It would make a wonderful focal point for people that enjoy the look of a fireplace, but don't have a real one. It measures 24x36" and is done in acrylics, and the sides are painted black, so there's no need for expensive framing; it's ready to hang. I signed it on the back, so owner can hang either vertically or horizontally, whichever they prefer. This is a very striking and contemporary looking abstract painting for anyone looking to add a bold, modern piece to their collection. Thanks for looking and if you have any questions, please email me.